I generally consider Taika Waititi the Wes Anderson of New Zealand. He has a similar, though less meticulous, visual style and a similar dry sense of humor. His films also feature a nice balance between comedy and drama usually in a family setting (or family-like group). If his 2010 film Boy is equal parts Bottle Rocket and Rushmore, Hunt for the Wilderpeople is his Moonrise Kingdom (Eagle Vs. Shark was more Napoleon Dynamite than Wes Anderson, even if Napoleon Dynamite was stylistically inspired by Anderson’s films). Another way in which Anderson and Waititi’s films are similar is that they take place in peculiar fantasy worlds that resemble the real world but they’re just a bit off. It’s all because the second we begin watching one of their films we inhabit a world belonging to the central character(s). Whether that is a world of vampires and werewolves (What We Do In the Shadows) or New Zealand’s wilderness, Waititi creates a world that undoubtedly revolves around his central character. 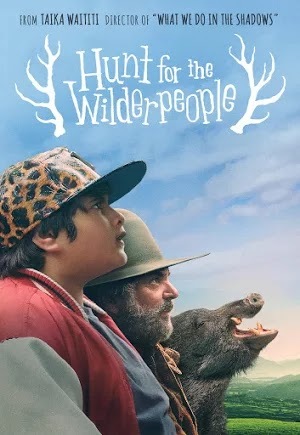 Based on Barry Crump’s book "Wild Pork and Watercress," the story involves rebellious foster child Ricky Baker (Julian Dennison) and his adoptive uncle Hec (Sam Neill) running from child welfare services in the wilderness of New Zealand’s Te Urewera. After bouncing around from foster home to foster home, Ricky ends up with Bella (Rima Te Wiata) and her curmudgeonly husband Hec. They are complete opposites in how they approach their newfound relationship with Ricky. Bella welcomes him with almost overwhelming love. But she isn’t afraid to make jokes at his expense either. She’s always willing to supply food for him, and she goes out of her way to make sure he has everything he needs. Often that includes his freedom. She continually tells him that he’s free to run away at night if he needs the space, so long as he’s home in time for breakfast. She has an uncanny knowledge of how to get through to him. Yet she’s so quirky it almost begs the question of how she ended up with someone as low key as Hec. Nevertheless, she’s so warm, kind and earnest that it’s nearly impossible not to be won over by her in these early scenes. Hec, on the other hand, is an outdoorsman. The strong, silent type. He can’t be bothered by this strange city boy and his penchant for gangster life. Worse yet he has a hard time hiding the fact that he never wanted to be a father, and Ricky is only with them because Bella wanted it. However, when Ricky runs far enough away to get himself truly lost, it’s Hec who goes out to track him down. But of course, because Ricky is clumsy and completely ignorant of the great outdoors, he finds a way to accidentally injure Hec. With Hec hurt, he and Ricky are forced to stay out in the wilderness taking care of each other for an extended period of time. Enough time, in fact, that child welfare services and the police launch a search for the two missing people assuming a case of kidnapping. The rest of the film becomes a chance for these two unlikely strays to bond while trying to stay one step ahead of the police. This film could have easily become cliched and sentimental, but Waititi is a smart enough writer and director to keep that from happening. Even if it’s another coming of age story and a story of a man learning to be a father, it’s consistently witty and clever enough to defy convention. As always Waititi’s comic timing is impeccable. He has a great sense of how far he can push his characters without taking them over the top. The lady from child welfare services (Rachel House) and her chase is the element that goes the most over-the-top. In fact it very nearly goes off the rails towards the film’s climax, but the grounded central characters and their natural performances keep it in check. It also manages to be quite moving from time to time. We care about these two people, and that’s no small feat. They might just as easily been unlikable if not for Waititi’s deft touch. Ricky and Hec might be the only “normal” people in a world full of goofballs. Speaking of goofballs, Waititi himself and comedic actor and longtime collaborator Rhys Darby show up for hilarious cameos. Their scenes are some of the funniest the film has to offer. But it isn’t just the comedy and dramatic elements that work. Waititi is also an accomplished visual storyteller. Some of his visual cues are reminiscent of those found in Wes Anderson films. For instance more than once he gives us a shot of a character looking toward another far away. The edit goes from the first character’s glance to a wide shot of the person he’s glancing at before a snap zoom gets a closer shot. But he also has a few more unique techniques up his sleeve. One spectacular sequence involves an unbroken camera pan around the forest showing several different areas at once. It shows us Ricky and Hec on the move and their pursuers picking up the trail, all set to Leonard Cohen’s "The Partisan" - a song that sounds made to play in the background of a Wes Anderson film if Waititi hadn't beaten him to it. However, aside from the occasional classic song, the music is where Anderson and Waititi’s tastes diverge the most. The majority of the soundtrack is done by the New Zealand based indie rock band The Phoenix Foundation, though here they’re using the pseudonym “Moniker.” For Wilderpeople they provide, at times, an almost synthwave score - particularly with tracks like “forest spirit” and “milestone 2.” It’s a strong set of music that’s well timed and plays well against cinematographer Lachlan Milne's images. This is a rare film that "gets it." It combines art and entertainment in a way all too lacking in mainstream Hollywood filmmaking. Between Boy, What We Do in the Shadows, and now Hunt for the Wilderpeople Taika Waititi has quickly become one of my favorite filmmakers working today (he also worked on Flight of the Conchords and The Inbetweeners). As such, I have incredibly high hopes for his upcoming Marvel Cinematic Universe debut with Thor: Ragnarok. Generally speaking, of all the Marvel films to date the Thor films have been among my least favorite. Yet Waititi’s involvement is enough to make the third, and likely final, film in the Thor series one of my most anticipated films of the coming year. Hunt for the Wilderpeople is proof that Waititi is a great filmmaker making “magestical” films.